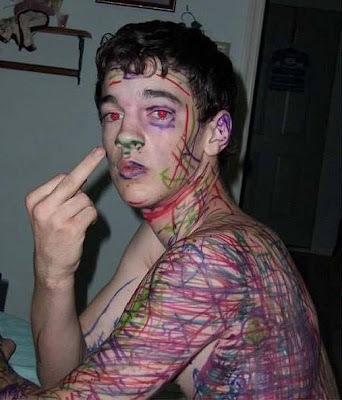 Crayola Boy indicates his displeasure at being voted off on Thursday's episode of the Bravo series "America's Next Super Hero." For once red-eye improves a photo. Huh? I've got a mark on me? Where? Wake up in the morning feeling like a Whiteboard, got my erasers, im out the door, i'm gonna hit this city.